« THE BRILLIANT FALL OF GIANNA Z. Book Club Contest! This post is part of a year-long series of blog interviews I’ll be hosting with my fellow 2009 Debut Authors, called "How They Got Here." It should be an especially helpful series for teens who write, teachers, and anyone who wants to write for kids. 2009 debut authors will be dropping by to talk about how their writing in school shaped the authors they are today, what teachers can do to make a difference, how they revise, and how they found their agents and editors. (You’ll even be able to read some successful query letters!) If you know a teacher or two who might be interested, please share the link! Today…Jennifer Brown, author of HATE LIST! 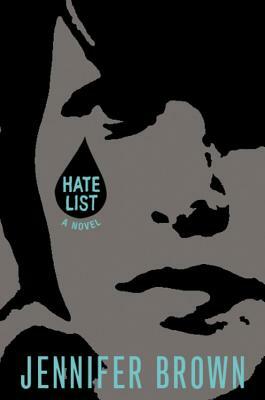 I had the good fortune to read an early copy of HATE LIST. Jennifer Brown’s YA novel about the aftermath of a school shooting, narrated by the shooter’s girlfriend and loaded with questions. The characterizations in this YA novel are some of the best I’ve ever read in any book for kids or adults. The characters, their motivations, and their responses to that awful thing that happened in the Commons on May 2nd all feel so very true and real that I had to keep reminding myself I was reading a work of fiction. This is a story about high school and bullying, about stepping too close to lines and crossing over them. And even though it’s also the story of a community’s worst nightmare, ultimately, it’s also a story about hope. Highly recommended…with a special note for teachers & librarians that this will make one heck of a compelling book club/literature circles choice. Welcome, Jennifer! Tell us about the first thing you ever wrote that made you think maybe you were a writer. While I can remember writing short stories as far back as 2nd grade (and thinking writing was really cool), I probably didn’t start thinking of myself as a potential writer until high school. I took Creative Writing my junior year and did really well with it, even writing and illustrating a children’s story. The story was about a kid who’d eat nothing but pizza. And then one day, pizza just started falling from the sky and just covered everything, and the only way for this kid to get home from school was to eat his way home. It was written entirely in verse and was really (pardon the pun) cheesy. But my teacher’s young daughters declared it their favorite of the class, and I was really proud. What books did you love when you were a kid? The Ramona books, Runaway Ralph, the Fudge books… basically anything Beverly Cleary, and also Judy Blume. Boy, I wanted to be Judy Blume! Is there a particular teacher or librarian who was a mentor for you in your reading and writing life? My mom was a volunteer librarian when I was very young (preschool-aged), and she would take me to the library with her and park me on the floor behind the desk with stacks and stacks of pop-up books. That is what started me on the road to loving to read! Moving on to the here and now, most writers admit that making time to write can sometimes be a challenge. When and where do you write? Do you have any special rituals? Music? Food & beverages? Depends on what I’m writing. If I’m working on a column or a blog, I write at my kitchen table, on the laptop. But for my Very Serious Writing (AKA: novels), I work in my office at the desktop. I always have to have something to drink with me at all times (morning = coffee, afternoons = big glasses of water, late afternoons = Diet Coke), and I have to have a hair elastic and hand lotion with me, as well. I usually light a good, smelly candle (because my office is in the basement, where the litterbox is), give the dogs a couple rawhides to keep them out of my hair, and get going! Do you have a favorite strategy for revision? I don’t really find revising to be all that difficult. I like the idea of making my work the best it can possibly be, and very rarely do I get upset over having to cut or change something. So I tend to just plow right through revisions, one chapter at a time. What’s your best advice for young writers? Keep going. There will be rejections, no matter how good you are. There will be days you think it will never happen for you. There will be people who will work hard to make you believe it will never happen for you. But if you just keep going… keep looking at the finish line… you will get there. What’s special about your debut novel? One special thing about my debut novel is that it was also my editor’s first acquisition. I think it’s so cool that we’re both going through a first together. And he’s the best! But the most special thing about Hate List is that it’s making people think. Making them look really hard at their lives and the things they say and do and the impact that can have on other people and on the world in general. I really like novels that make me think, and get a special little happy jolt every time I hear that Hate List is doing that for other readers. What were the best and worst parts of writing it? Best — Revisions, because that’s when I really got to know my characters and make them come to life. Worst — Because of time and work constraints, I had to get up at 5:30AM every day for most of a year to write it. How did you find your agent and/or editor? I’ve actually had my agent for several years, when she signed me to represent a women’s fiction novel I’d written. It was a blind submission — I think I was actually querying another agent in the agency — and we didn’t sign until more than a year after I made the initial query. We’re a perfect match, and I’m so happy with my agent. She’s like a friend. Thanks for joining us, Jennifer! You can read more about Jennifer at her website. You can pick up your copy of HATE LIST at your local independent bookseller, order it through one of my favorite indies, Flying Pig Bookstore (they ship! ), or find an indie near you by checking out IndieBound!